In this play of old world Europe, Peter Juhâsz, who owns a fine haberdashery in Budapest, knows his scarves, neckties, and how to cater to fancy customers well enough but he’s too angelic a man for business. He gives credit too easily and, generally, he just doesn’t “get” the bottom line … until, in a single day, because of his lack of financial acumen, the business is put into receivership and, to top it off, his wife leaves him for his best sales clerk. His Excellency the Count, who appreciates Peter’s honesty, saves the day by giving Peter a manager’s job on his country estate. Paula, the pretty shop girl at the haberdashery has been carrying on a flirtation with the Count that she hopes will make her rich. She follows Peter to the Count’s estate ostensibly out of loyalty to him but really to continue her quest for the Count, and the “pretty places and beautiful clothes” he could give her. Peter, who’s fallen in love with Paula and has no idea of her true purpose, tries to protect her from the nefarious desires of His Excellency who, finding his interfering a nuisance, fires Peter– back to Budapest with you! Which for Paula turns out to be not quite the relief that she expected. Will the desirable woman choose the rich older Count or the young, poor but oh-so good haberdasher? that is the question. The choices that women make for love and the sacrifices they make for their lovers have illuminated many great issues in life and literature, but what’s illuminated here? Fashions for Men seems a vehicle for no more than a familiar, always titillating, situation – the clandestine flirtation of a poor young woman with a sugar daddy, that and a few laughs. As Paula, Rachel Napoleon is charming though with a somewhat strained voice. Kurt Rhoads’ vitality and outstanding stage presence as the Count make one wonder why Paula would be drawn to limply virtuous Peter anyway, though he’s ably played by Joe Delafield? Jeremy Lawrence as the wise old store clerk is completely natural and engaging. A variety of briefly seen characters in Peter’s haberdashery search for socks and raincoats with perfect comic timing and humorous costumes – of the period and yet hilarious. 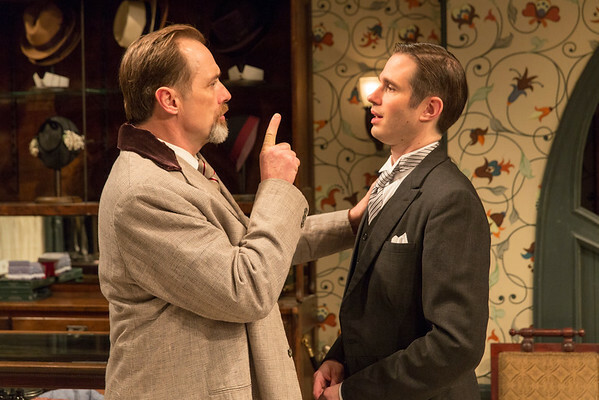 The set, particularly that of the haberdashery, is breathtaking: realistic and accurate in detail – and broadly gorgeous! 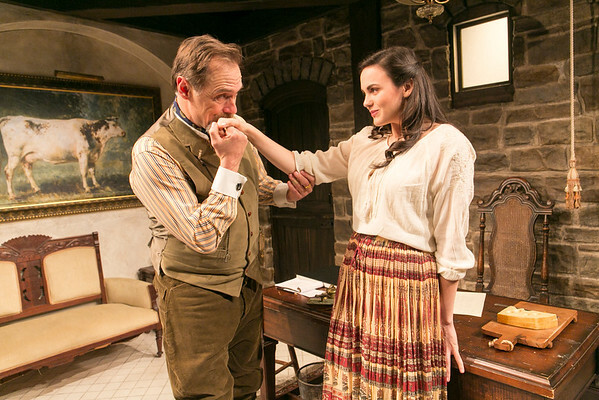 The mission of the Mint includes producing “worthwhile plays from the past that have been lost or forgotten …to bring new vitality to these plays and to foster new life for them,” and every play I’ve ever seen at the Mint has done just that! From George Aiken’s Uncle Tom’s Cabin, to D. H. Lawerence’s The Daughter-In-Law (who knew Lawrence wrote plays? ), to Hemingway’s The Fifth Column (who knew Hemingway wrote plays?) to Wife to James Whelan by Teresa Deevy (who’s that?) and many more — each has been a revelation of just the kind the Mint intends. What a record! Fashions for Men shares with these a fine production and the opportunity to come to know more broadly theater of the past. Still, I wonder if, among Molnar’s plays (not including Liliom which is fairly well known), this was the best choice for a revival. Fashions for Men plays at The Mint Theater on West 43rd Street in Manhattan through April 12, 2015. A thoroughly charming production. The cast is delightful, particularly Joe Delafield, whose character is too good for his own good. But why hasn’t this play been reviewed in the Times? As of March 6, it’s not even listed. Time Out NY omits it, too. You probably know but because you were interested I just wanted to make sure — review of Fashions For Men is in today’s NY Times 3/10/15). I like “Carousel” and it would be fun to see a play by Molnar since his play Liliom was the inspiration for Carousel. This was a delightful but very superficial play – like candy cotton or perhaps more appropriate Schlag! It does not compare to Liliom but is a light evening’s entertainment. Perhaps the I love Lucy of the day .